As a big fan of Superman, I got really excited when I saw this photo of Mario Maurer. He was wearing an awesome Man of Steel shirt! I don't want to experience the same thing with the Iron Man shirt of Folded and Hung so I checked this today at Penshoppe Megamall. Unfortunately, what I only saw was the black shirt below. I was telling one of the staff that the shirt from Penshoppe's FB page was blue, and it is really expected to be blue since Superman's color is blue and red. I asked if they already released the one worn by Mario (they might be more familiar with it), that it might have been sold out already but all they were saying was they only have the black one and no blue shirt was released. I was a little sad but what I'll do next is to verify if the other stores indicated in their FB page already released the shirt I'm looking for. So for now I still have no luck with these limited edition super hero shirts boo! 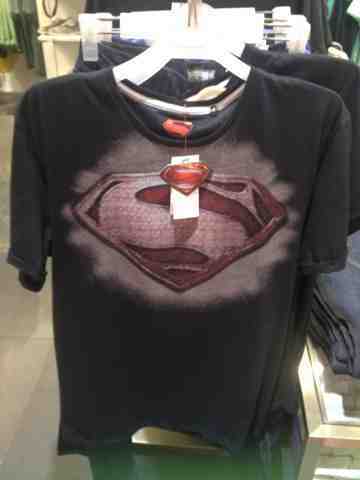 So whether you are a fan of Superman or not, would you purchase the black shirt that cost P549.00? I think the price is a good deal if it was the blue one. The design was really catchy and the colors are vibrant. I'm still hoping I could buy one. Fingers crossed!